What happens in Vegas... gets blogged. 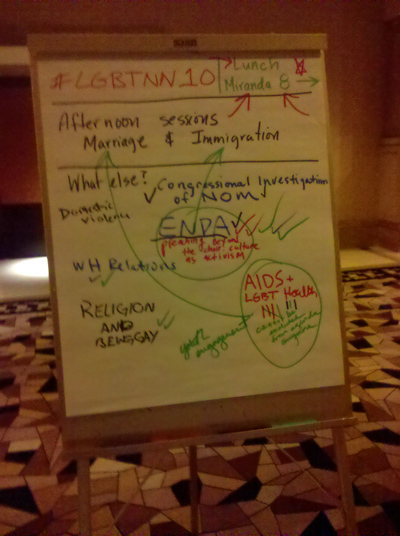 So far, Its been a stimulating overload of new faces, old friends, and some overhashed discussion. I love it though and I couldn't be more happy to be be here at Netroots Nations with the Bilerico gang. 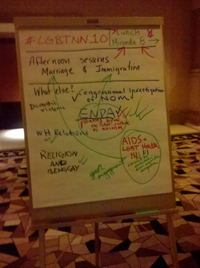 Day one was the LGBT pre-con, a congregation of over 60 of the nations most fervent bloggers. ENDA, DADT, more ENDA, and Dan Choi still looks hungry. I admit, aside from all the hotel parties (Mike Rogers sure can throw a boozer), huddle sessions, and card swapping, I had to get away. In a quiet corner in one of the 4 Starbucks at the Rio, I sat with Steve Hildebrand. It was a breath of fresh air. The whole point for going to Netroots Nation was to see where I could find my fit in activism. Its not secret I can't tell you where we are with ENDA, I don't always fit in with the views on Don't ask, Don't Tell, and I still don't understand what GetEQUAL was doing blocking traffic this week. Chatting with Steve, however, gave me some hope, as we talked a bit about my childhood, what it was like to grow up Southern Baptist in the South, and some of the serious damage churches with even the best intention can inflict on the LGBT youth growing up conflicted. Steve is working with Faith in America, the small and hopeful group started by Mitchell Gold, trying to reach out to religion-poisioned youth in America. As I shared my experiences, I realized... this is my background. I have real experiences, and the best part is: I'm not bitter. Day 1: A success. I still haven't adjusted to the time, but as Netroots offishally kicks off this week, I'll be focusing my session schedule on the backend of activism: media campaigns and metrics driven site design. As I said, I may not know (or care, honestly) enough to be a front man for politics, but I'm more than happy putting my media skills to work. What happens in Vegas... gets blogged. "You write what you know." Amen. That's all we can do: it's what we know - our gifts, even our sucky ones - that are our strongest weapons.